We will ascend the Chulu West Peak lying at an elevation 6419m and make the reverie come true climbing one of world’s most striking spot of Annapurna Region. There are actually two Peaks of Chulu- East as well as West. While climbing the Chulu peak, we will be able to take pleasure from wonderful views of Nilgiri, Dhaulagiri, Annapurna, and several other Himalayas. Climbing the Chulu West Peak needs a good bodily condition and good degree of energy with good skill of using crampons, ropes, ice axes, etc. The entire peak climbing will bestow an awe-inspiring climbing adventure of a life span with stunning Himalayan view and then China so near to you on the north side. We will first drive to Khudi from there we will begin our trek. 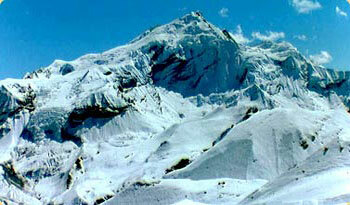 The track leads gradually to the Manang Valley, one of the uppermost valleys of the earth. We will install two camps after moving ahead from the Base Camp. After reaching at the apex of the Chulu West, we go again passing through the Thorung-La Pass as well as Muktinath to reach Jomsom. From Jomsom, we will depart for Pokhara and then drive back to Kathmandu. Boundless Himalaya Trekking and Expeditions puts forward Chulu West peak climbing intended to everyone from proficient climber to an inexpert adventure enthusiast. Spring and autumn are the best time of year to go for Chulu West peak. Besides, you will go by unexpected range of scenery and let you view unique way of life; traverse rhododendron plus pine forests; the terraced lands, Gurung community and the warm character of Manange citizens. Day 14 : Summit Chulu West (6,419-meter) return back to base camp.